On April 18th, the Department of Water Resources increased State Water Project Allocations from 0% to 5%. 1991 was the last time allocations were cut this low, when municipal customers received 30% of their allocation, while agriculture received none. Today, DWR does not distinguish between customer types when making allocations. The SWP – which delivers water to 29 contractors in California – will still deliver “carryover” water stored by local agencies and water transfers, as well as sufficient supplies for drinking, sanitation and fire protection. …Sacramento River Settlement contractors and Central Valley Project refuges will receive 75% of their contracted supply, up from 40% last week. …State Water Resources Control Board approved a deal that will allow the Merced Irrigation District to take an additional 30,000 acre-feet of water from Lake McClure. 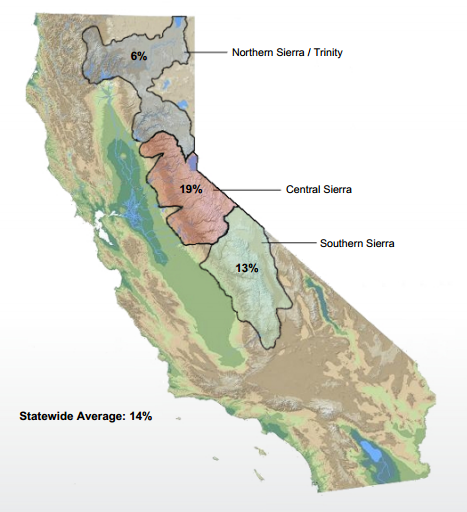 …After hearing their allocation would be cut in half, districts with strong water rights on the Feather River will receive their full allocation. Some districts are also considering selling about 20% of their water to State Water Contractors south of the delta, at the cost of $500 per acre-foot. 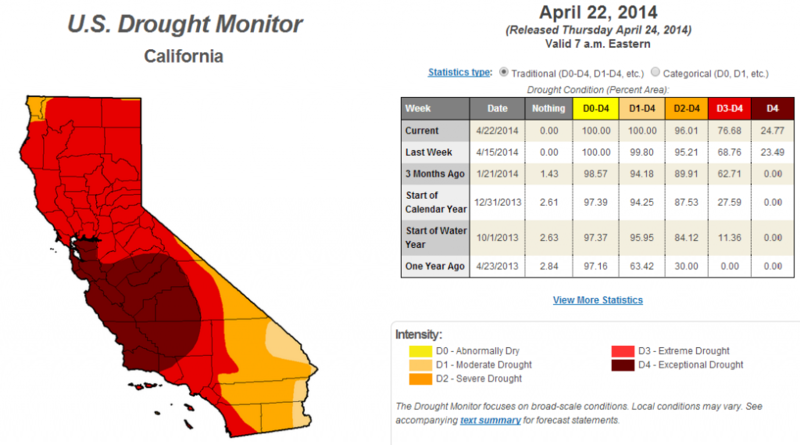 …And for the first time ever, East Bay Municipal Utility District will get water from the Sacramento River. 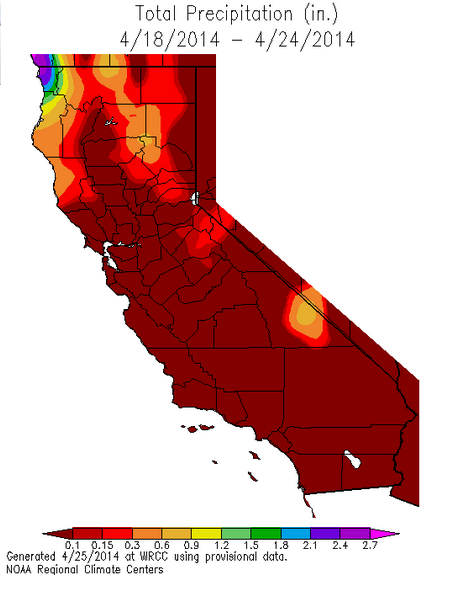 The California drought has gotten slightly worse this past week, with 77% of the state in extreme to exceptional drought, up from just over 69% last week. Although precipitation remains a small fraction of the historical average, areas in the north did experience some rainfall this past week. Precipitation is forecast for this weekend in the Bay Area and in the Sierra Nevada mountains, however, it is not expected to have a significant impact on the drought. California snowpack is currently at about 14% of the April 1st average, down from 19% last week, and continue to drop rapidly. 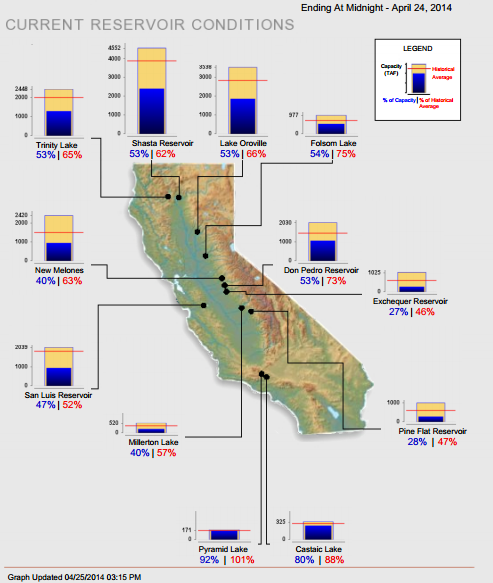 Statewide, California reservoirs are at about 49% of total capacity and about 66% of the historical average. The state’s nine largest reservoirs, representing about 74% of the state’s capacity, are below 54% of total capacity. 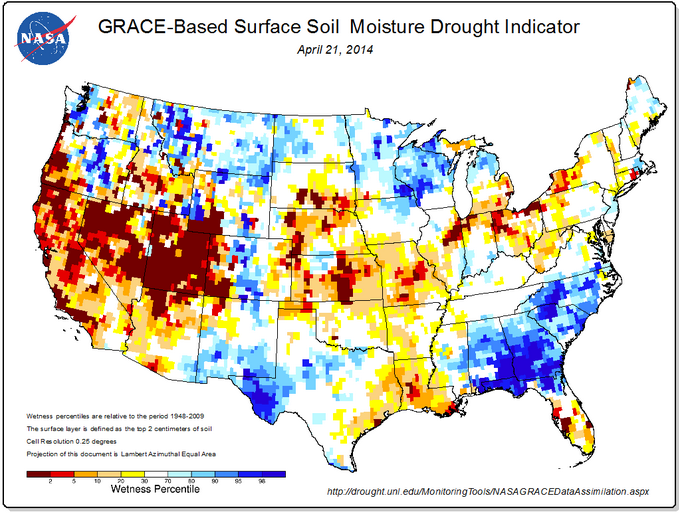 California soil moisture has worsened this past week, particularly in parts of Northern California, the Central Valley, the central coast, and the Los Angeles area.